I don’t know how or when nachos became my most favorite food on the planet, but seriously, to me, there is nothing better in this world than a fat messy plate of nachos. With or without meat, with or without beans, I could really care less. There aren’t many nachos out there I don’t like. Search #connoisseurofnachos on Instagram, it’s my very own hashtag for all the insane nachos I make and eat. The recipe I’m about to share with you is one I have been perfecting for like, over 10 years. Sheesh. Does that date me? I hope not. And to be honest, this is one of those continually evolving dishes. However I make nachos tends to reflect what I’m groovin’ on at that time. This here plate of beauty in particular was crafted with a chipotle cheese sauce because is there anything more delicious in this world than chipotle anything? The answer is no, there is not. It was the first time I tried adding chipotle to this cheese sauce and it knocked my socks off. I made these for myself for my birthday lunch. I ate the whole plate (shutup) by myself (I know, I know) while sitting on my couch watching a really old move. Shutup, it was my birthday, I can do whatever I want on my birthday. I would contend that no Cinco de Mayo party is complete without a plate of nachos. Just sayin’. I might even make nachos for dinner that night just cuz I can. 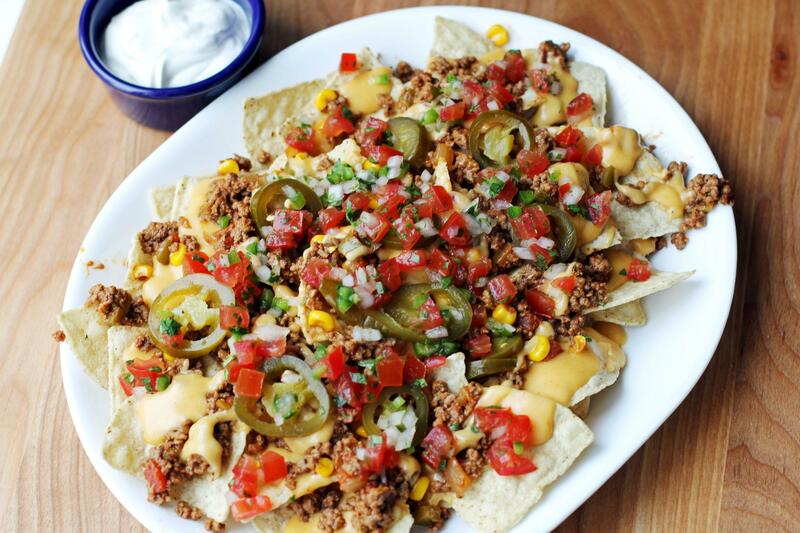 Cuz nachos are the greatest thing ever. Prepare ground beef: Preheat oven to 300 degrees F. Brown your ground beef in a large skillet over medium heat, breaking into crumbles as it cooks. Drain well in a colander. Rinse the excess fat out of the skillet and return to the stovetop. Return the beef to the pan over medium heat, and add the salsa, chili powder, and cumin. Stir well to combine. Taste if desired to see if you need more seasonings. Add the corn and stir to combine. Add Tabasco to taste. Turn heat to low and stir periodically so the corn thaws. 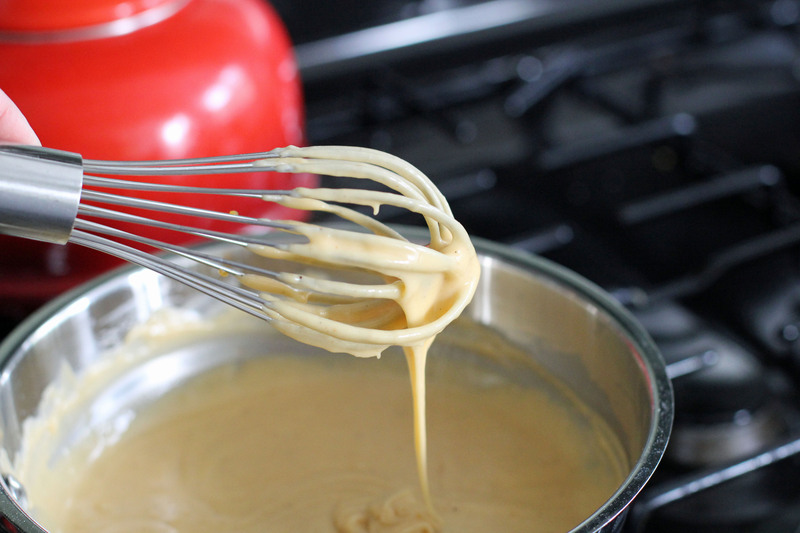 Prepare cheese sauce: Melt butter in a saucepan over medium heat. Add flour and whisk quickly to combine. Whisk in the warmed milk, whisking constantly until it thickens. Once it thickens, lower the heat to low. Season with salt and pepper as desired. Add shredded cheese and whisk gently until completely melted. Taste, and if it’s too bland (it will be), add Tabasco sauce until there’s some heat. Leave on low, and whisk periodically to keep it combined. Prepare nachos: THIS IS MY FAVORITE PART. Pour a layer of tortilla chips onto a large, oven-safe platter. Place in the oven for about 5 minutes to warm. Remove the platter from the oven, and ladle on some of the cheese sauce. Then, scoop some of the ground beef mixture all over the chips. Ladle on some more cheese sauce if desired. Then top with all your favorite toppings – pico de gallo, diced tomatoes, pickled jalapenos, scallions, cilantro, and/or sour cream. THEN YOU MUST GO FORTH AND ENJOY.